Single serving exposures. 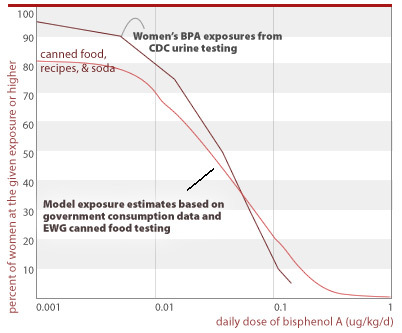 For 1 in 10 cans of all food tested, and 1 in 3 cans of infant formula, a single serving contained enough BPA to expose a woman or infant to BPA levels more than 200 times the government's traditional safe level of exposure for industrial chemicals (Figure). The government typically mandates a 1,000- to 3,000-fold margin of safety between human exposures and levels found to harm lab animals, but these servings contained levels of BPA less than 5 times lower than doses that harmed lab animals. Chronic exposures. Our analyses show that for women who routinely eat canned food, chronic exposure levels throughout pregnancy can exceed safe doses. For example, the BPA dose for one-quarter of all women eating 2 servings of canned food daily would fall within a margin of 10 from levels linked to prostate damage and diabetes in studies of in utero exposures. Methods and findings from our in-depth analysis of BPA exposures for women and infants are described in detail below. Our analysis shows that single servings from 20 of the 53 cans with detectable BPA put consumers within an uncomfortable range of the levels that directly harm lab animals. These tests found levels just 1.6 to 10 times lower than the doses that impacted the male reproductive system and caused increased aggressiveness in lab animals (2 ug/kg-day) (Nagel 1998; Kawai 2003). In comparison, regulatory agencies typically require a margin of safety of 1000 to 3000 between human exposures and the effects found in animal studies. Methods of analysis are described below the figure that displays exposure findings for each food type we tested. While most of the available BPA toxicity studies dose lab animals over longer durations than a single day, short-term or every single day doses such as those estimated below can be significant when they occur in windows of vulnerability during development. Source: Chemical analyses of 97 canned foods by Southern Testing and Research Division of Microbac Laboratories, Inc., North Carolina. EWG calculated people's BPA exposures from canned food using the following assumptions: Calculations reflect a single adult serving, using label serving size and body weight of 60 kg (132 lbs); exposures for concentrated infant formula is calculated for exclusively formula-fed infant using average 3-month-old body weight (6 kg or 13 lbs) and average daily formula ingestion (840 g or 30 oz); formula is assumed diluted with water free of BPA. 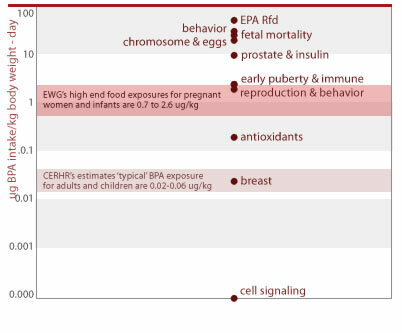 Estimated single-serving exposures are compared against BPA dose of 2 ug/kg/d linked in lab studies to permanent damage of reproductive system from in utero exposures and referenced as "toxic dose" in figure above (see Section 3 of this report). Government safety standards are often set to control human exposures at least a factor of 1,000 below the harmful effects in animal studies. This margin of safety is incorporated because public health agencies are aiming to protect, in the case of a developmental toxicant like BPA, four million pregnancies each year based on data from which is typically a small number of laboratory animals. Agencies normally incorporate safety factors to account for intra- and interspecies differences (rat-to-rat differences in susceptibility, and rat-to-human differences, for instance) as well as factors to account for data gaps and other uncertainties. In the case of BPA toxicity, the lowest exposure of 2 to 2.5 ug per kilogram of body weight per day via food or water shows permanent effects to reproductive systems, antioxidant hormones, behavior and hormone levels (Nagel 1997; Chitra 2003; Kawai 2003; Howdeshell 1999; Honma 2002). With these lowest-dose studies in mind, we tallied the percent of our canned food samples that would subject an average consumer to an unacceptable risk of harm. The exposures reflected below for infant formula would be even higher for children younger, lighter, or hungrier than the typical 3-month-old assumed for our assessment. We tallied the percent of cans by food type that contain servings of BPA-contaminated food that would fall within a margin of 5 to 100 of the 2.0 ug/kg-d BPA dose linked to permanent effects in laboratory animals. All the canned pasta and half the canned tuna and beans tested contain levels of BPA in a single serving that would exceed a level of exposure calculated using a margin of safety of 100, or an exposure level 100 times less than that associated with harmful health effects in laboratory studies. One-third of the canned infant formula tested contained levels of BPA in a single serving that would exceed a level of exposure calculated using a margin of safety of just 5. The most comprehensive assessments of BPA exposure are body burden studies of adults and pre-teen girl by CDC measuring BPA urine concentrations. The NTP-CERHR reviewed this and other body burden studies. They conclude that overall the urine monitoring data suggests typical daily intakes of bisphenol A between 0.02 and 0.06 ug BPA per kg bodyweight per day (ug/kg-d) in American adults and children (CERHR 2006). Our analyses also show that a serving of the food (within each food type tested) with the highest BPA levels result in doses 10 to 20 times higher than those deemed 'typical' by CERHR's review document, and exceed the highest exposures measured in two CDC biomonitoring studies of nearly 500 adults and 7 year-old girls (Calafat 2005; Wolff 2006). These estimates are labeled "high-end food exposures" in the chart below. Several important factors can drive people's exposures to BPA even higher than the estimates above, including portion size and differences in infant size and consumption rates. Larger portions. Our calculations are based on 'official' USDA serving sizes, which underestimate the amounts many Americans eat. For instance, one 15 oz can of chicken soup, considered to be two servings by the government, could easily be eaten in a single meal. The BPA dose for a pregnant women eating this can of soup would be 2.6 ug/kg body weight, and would exceed the doses in the most sensitive studies with absolutely no margin of safety. Exposure considerations for infants. EWG detected BPA in 2 of 6 concentrated infant formulas. Our calculations suggest that infants consuming concentrated formulas may be among the most highly exposed in the population. Prior to serving concentrated formula to an infant, parents and other caregivers dilute it 50 percent with water. We calculate that a 3-month-old child eating formula with detectable BPA would have ingested 0.76 or 1.2 ug/kg-day from the 2 formulas with detectable BPA in our sample of 6 cans. A 3-month-old infant of average weight and appetite being nourished exclusively from these formulas would receive concentrations of BPA approaching those in the lowest dose toxicity studies. Since infants typically eat the same brand of formula repeatedly, these harmful exposures could occur daily for their first 6 months of life. Lighter infants or those who drink more than 30 oz per day would have an even more intense exposure. FDA's exposure calculations have used the same daily intake but a 4 kg infant, for an even higher relative dose (Bailey, FDA 1996). There are few published studies on BPA levels in other formula or other foods eaten by infants. One study by Taiwanese researchers determined the levels of BPA in six brands of canned powdered infant formula. BPA was detected in all samples at concentrations ranging from 45 to 113 parts per billion (ug/kg), much higher than levels detected in the concentrated formula samples tested by EWG (Kuo 2004). The authors calculate a 2.3 ug/kg-d exposure from these formulas alone for a 3-month-old infant (Kuo 2004). These results are greater than EWG's findings for concentrated liquid formula and would need to be confirmed in US formula samples and in a second laboratory. In the meantime there is a critical data gap about the magnitude and safety of infant exposures. Assessment of canned food exposures versus CDC's measured exposures in 200 women. We conducted analyses to find if the levels of BPA in canned food found in our study could account for a substantial fraction of CDC's measured exposures in the general population, as is expected. These preliminary assessments confirm the dominance of canned food as a BPA exposure source, but also suggest that other sources may be important, particularly in the lower ranges of exposure. To conduct this analysis, we relied on the government's National Health and Examination Survey (CDC 2002) for data on canned food consumption. This survey, which we maintain in-house in an electronic database, contains one-day, detailed consumption records for 1,929 women of childbearing age (ages 15-44), of whom 1,887 report their body weight. We coupled the canned food consumption data and body weight information from this database with the BPA concentrations from this food survey, averaged by food type. We assessed three scenarios, one in which we analyzed the one-day exposures for each woman in this database who specifically reported eating food from a can, one for which we include reported soda consumption in addition to canned foods, and a third for which we include potential BPA exposures from foods that can contain canned foods as significant ingredients. For soda and foods that may in part be made from canned ingredients, we may overestimate BPA exposures — the consumption database does not distinguish the fraction of soda contained in cans versus other containers; or the fraction of foods made from canned ingredients. For the purpose of this preliminary calculation, in both these cases we assume that all of the food is contaminated with BPA at the levels we have measured. We compare the distributions of exposure generated in the final scenario with the exposures indicated by CDC's measurements of BPA in 200 women. We have assumed that CDC's measurements are representative of population-wide exposures for women of childbearing age. 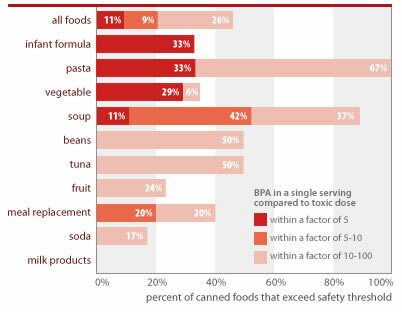 These analyses, shown in the chart below, indicate that canned food is a substantial source of BPA exposure. Our analyses under-predict BPA in the low ranges of exposure, suggesting that other sources may be significant in these ranges. Further research in this area should include the use of consumption databases with more comprehensive information on canned food consumption than that provided in government databases. This information is available from commercial sources. Exposures above reflect the following single-day consumption rates from NHANES: 69% of women report eating canned food or soda (does not include foods with canned ingredients); 40% - 1 serving; 20% - 2 servings; 6.9% - 3 servings; 1.6% - 4 servings; 0.5% - 5+ servings. For canned food consumption only (no soda, no accounting of food made with canned ingredients) consumption rates are: 11.7% - 1 serving; 1.5% - 2 servings; 0.15% - 3 servings. We conducted analyses to predict average, chronic exposure levels for women who regularly eat canned food. As with our predictions for single-day exposures, we relied on body weight information for women of childbearing age (15-44) from CDC's National Health and Examination Survey. We conducted a Monte Carlo simulation in which women were sequentially assigned BPA concentration and food consumption types and quantities from our underlying databases, for 280 days throughout pregnancy. We calculated each woman's average BPA exposure during pregnancy as the sum of all of her individual, daily BPA exposures divided by the duration of pregnancy. For each woman included in the simulation and for each "food eating" event in her pregnancy, we randomly assigned a BPA concentration from among our canned food test results, and randomly assigned a serving size from among the serving sizes reported in NHANES for the particular food type assumed. For each simulated "eating occasion," we randomly selected the food type consumed using a weighting function that reflected the relative chance each food type would be consumed by a woman of childbearing age on any given day. EWG analyzed chronic exposures for women who eat either 1, 2, or 3 servings of canned food daily throughout pregnancy. We compared the percent of women in each of these scenarios who would exceed a given dose, against a number of toxic doses measured in lab studies. In each case, we found that significant fractions of women who regularly eat canned food would exceed safe levels of BPA exposures on average throughout pregnancy. Our analysis relies on government canned food consumption data and measured BPA levels from our tests of commonly eaten canned foods. We did not include soda consumption in these analyses. All women eating 1, 2, or 3 servings of canned food per day, respectively, would get an average BPA dose above that linked to breast cancer and damage of the female reproductive system (0.025 ug/kg/d). 54% and 95% of women eating 2 or 3 servings of canned food per day, respectively, would get an average BPA dose less than a factor of 10 away from doses linked to prostate damage and aggression in addition to effects listed for higher doses above (2.0 ug/kg/d). All women eating 1, 2, or 3 servings of canned food daily are exposed to BPA doses within a factor of 100 from this toxic dose. 24% and 84% of women eating 1 to 3 servings of canned food per day throughout pregnancy would get an average BPA dose less than a factor of 10 away from doses linked to early puberty and diabetes (2.4 ug/kg/d) in addition to effects listed for higher doses above. All women eating 1, 2, or 3 servings of canned food daily are exposed to BPA doses within a factor of 100 from this toxic dose. 53%, 99.6%, and 100% of women eating 1, 2, or 3 servings of canned food per day throughout pregnancy, respectively, would get an average BPA dose less than a factor of 100 away from doses linked to prostate damage and diabetes in addition to effects listed for higher doses above (10 ug/kg/d). 2.6% of women eating 2 servings of canned food per day throughout pregnancy would get an average BPA dose less than a factor of 100 away from a dose linked to structural damage of the brain (30 ug/kg/d). 55% of women eating 3 servings of canned food per day throughout pregnancy would also exceed this margin of safety.